After 1 year and $10,000 invested in Betterment, I am a happy customer and recommend it to family, friends, and blog readers. My initial review is here and my review at $3000 invested is here. 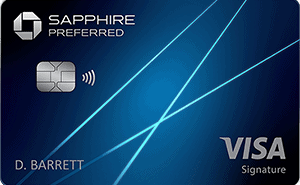 I track my Betterment account, along with my TSP and Vanguard accounts, all in one place with Personal Capital. It's free, easy, and gives you beautiful data on your portfolio. While you can get lower costs in the TSP and Vanguard, the automation, simplicity, low cost, and built in diversification make Betterment easy to recommend. These four principles guide my investing decisions. Betterment's average fees on their ETFs are 0.10% or 10 basis points for my asset allocation (90% stocks, 10% bonds) plus the 0.25% management fee (for accounts $10,000-$99,999). While 0.35% or 35 basis points is nearly 10 times higher than my TSP account, it's still nowhere near the industry average of 1% annual expense ratio. On a $10,000 initial investment with a 0.35% expense ratio, over a 50 year period, with 6% returns, you could expect to lose about 16% of your returns to fees. If your expenses were only 0.03% (close to the TSP's), you would only lose 1.5% of your returns to fees. Run the numbers yourself here. Also it's important to note that while fees matter, asset allocation can matter even more when it comes to determining your investment returns over the long run. Concentrating too much in the G fund or another bond fund early in your investing life can reduce your returns substantially. It's important to have a good asset allocation and Betterment makes it easy to select and stick with one. The importance of a good asset allocation can significantly outweigh the additional cost of Betterment. Clearly DIY with TSP and Vanguard is cheaper in the long run, which is why I recommend maxing out your TSP contributions first. However, once that's maxed, Betterment is an easy place for your IRAs and additional taxable investment accounts. Especially if you are not the type that dreams of asset allocations, backtests portfolios on Portfolio Visualizer, and reads for fun about Modern Portfolio Theory and the efficient frontier, then Betterment is one of the best investment option available today. If you are new to investing, I recommend opening an account today and at least fully funding your IRA (Roth or Traditional) with them. As you grow as an investor and learn more about asset allocation, you can eventually move your money to Vanguard for the lower price but more DIY approach. The user experience is fantastic. Both the mobile app and the browser page are slick, present information clearly, and are quick to use. You can see projections of your growth and deep dive into their theories and models for your portfolio. Deposits to the account usually take 2 business days to process out of the checking account but they credit your account immediately, which is a good feature. Automatic tax loss harvesting is already included in all Betterment accounts. Tax loss harvesting can be a complicated tax reduction strategy that involves selling ETFs that have lost value and buying similar ETFs that cover the same asset class. It's estimated by turning on tax loss harvesting your return can be boosted by up to 0.77% annually, more than compensating for the increased expense ratio of owning ETFs through Betterment rather than buying them yourself. 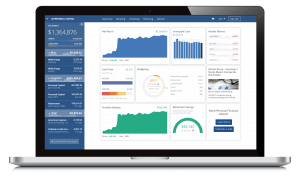 Now Betterment is adding the tax coordinated portfolio, which they claim could add another 0.48% or 48 basis points annually to your return. A tax coordinated portfolio holds asset classes in different taxable and untaxed accounts to maximize your returns. So for instance municipal bonds, which are income tax free, would be held in a taxable investment account. More heavily taxed assets would be held in tax exempt or tax deferred accounts. Again, this is done automatically and without additional costs to the account holder. These kinds of automatic systems really show what's possible when you apply Silicon Valley innovation to financial markets. I'm excited to see what Betterment introduces next and the future of financial innovation that benefits the everyman investor, not just the well connected Wall Street insiders. 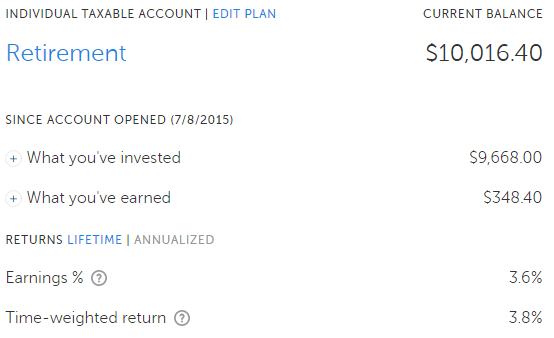 I use Betterment for my RothIRA which I maxed out in August 2015. It has now reached over $6000 without me adding a dollar.